The Catholic Church in Mexico is part of the worldwide Catholic Church, under the spiritual leadership of the Pope, his Curia in Rome and the national Mexican Episcopal Conference. The history of the Catholic Church in Mexico dates from the period of the Spanish conquest (1519–21) and has continued as an institution in Mexico into the twenty-first century. In the late 20th century, Eastern Catholic jurisdictions were established in Mexico. The history of the Catholic Church in Mexico can be divided into distinct periods, the basic division being between colonial Mexico, known as New Spain and the national period, from Mexican independence in 1821 until the current era. The era of the military conquest in the early sixteenth century saw the Church's huge effort to evangelize the indigenous population of Mexico in what is termed "the spiritual conquest". As the Spanish Empire expanded into new territories, the incorporation of the indigenous population was a priority for the crown. The growth of the Spanish and mixed-race urban population of Mexico prompted the establishment of the episcopal hierarchy, under the patronage of the monarch and the creation of dioceses in Mexico. In the national period, following independence in early nineteenth century, Mexico established a legal framework that continued the privileged status of the Catholic Church as the sole religion. The liberal Reforma of the late 1850s sparked an extended period of violent conflict between the conservative supporters of the old order and liberals who sought to displace and diminish the power of the Church. 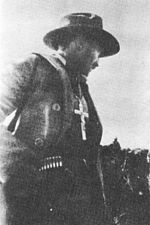 The Mexican Revolution was won largely anticlerical Constitutionalists and the Church's role in Mexico was restricted constitutionally. After a period of violent open conflict over religious matters, Church-State relations returned to a modus vivendi while the anticlerical constitutional framework remained in place. Expansion of Catholic participation in the establishment of religious educational institutions and the creation of a conservative political party, the National Action Party with no direct ties to the Church was an important characteristic of the late twentieth century. A new constitutional framework was created in 1992, which lifted many but not all restrictions on religious freedom and the Catholic Church in Mexico. Enrique Gorostieta Velarde was a Mexican soldier best known for his leadership as a general during the Cristero War. 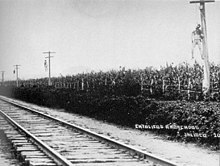 Government forces publicly hanged Cristeros on main thoroughfares throughout Mexico, including in the Pacific states of Colima and Jalisco, where bodies would often remain hanging for extended lengths of time. Distinct from the Catholic Church in Mexico, the Mexican National Church emerged during the Mexican Revolution, when antagonisms against the Church of Rome were inflamed on account of its connection to historic Spanish colonialism. After several attempts at establishing a national church, the Mexican Catholic Apostolic Church was founded in 1925 by José Joaquín Pérez Budar [es] with the support of the Regional Confederation of Mexican Workers and the Mexican President Plutarco Elías Calles. (p52) It quickly incorporated Mexican communities in Texas into itself. The National Church continued as an “Old Catholic” community until Father José Cortes y Olmos was appointed its bishop in 1961. Over time he and his clergy determined that the ecclesiology of the Old Catholics did not satisfy the Marks of the Church and took on the name Iglesia Ortodoxa Católica en Méxicao (Orthodox Catholic Church in Mexico) for their community. In 1965 Bishop Cortes contacted Dmitri Royster, then the rector of Saint Seraphim Church in Dallas, Texas. Royster played an important role as an Orthodox missionary to Mexico and liturgical translator. After Father Dimitri’s consecration to the episcopacy in 1969 and the granting of autocephaly the following year, Bishop Dmitri presented the case of the Orthodox Church in Mexico to the hierarchy of the Orthodox Church in America. As a result of numerous exchanges, the Holy Synod sent Royster to conduct an official investigation on the state of the Church in Mexico and to produce a report, which would be studied by the OCA Department of Canonical Affairs. Upon review of Royster's report, the Department recommended that the Orthodox Church incorporate the Mexican communities. In 1971, Cortes petitioned for the OCA to integrate his community. He and his fellow clergy were received at their Catholic ecclesiastical ranks, while an estimated ten to twenty thousand faithful were also received into the Orthodox faith. Pope Francis greets the faithful in the Zócalo during his visit to the Palacio Nacional as Head of State of the Holy See. The Catholic Church is the world's largest Christian church, and its largest religious grouping. The 2010 census reported that Mexico had some 101,456,786 Catholics among the population aged five and above, which equates to around 91% of the total population, making it the second largest Catholic country in the world after Brazil. The country is divided into 18 Ecclesiastical provinces, containing a total of 90 dioceses. There are 15,700 diocesan priests and 46,000 men and women in religious orders. Pope Francis selected 15 new cardinals for the Church in January 2015, one of whom was for Mexico in the archdiocese of Morelia. Alberto Suárez Inda is Morelia's first cardinal. According to an Associated Press story, he "has helped mediate political conflicts and kidnappings in one of Mexico's most violence-plagued states". The Missionary Sons of the Immaculate Heart of Mary in Rome, The Claretian Order. ^ a b Roberto Blancarte, “Recent Changes in Church-State Relations in Mexico: An Historical Approach.” Journal of Church & State, Autumn 1993, vol. 35. No. 4. ^ Bailey, David C. (1974). Viva Cristo Rey! : the Cristero rebellion and the church-state conflict in Mexico. The Texas Pan American series. Austin, TX: University of Texas Press. ISBN 9780292787001. ^ a b c d "The thirtieth anniversary of the repose of Bishop José". Orthodox Church in America. 28 January 2013. Retrieved 14 May 2016. ^ Associated Press, "Pope's selection of 15 new cardinals reflects church's diversity, growth." The Washington Post January 5, 2015, p. A7. ^ "The Museum of the San Fernando Valley: CLARETVILLE NOVITIATE IN CALABASAS". museumsanfernandovalley.blogspot.com. Retrieved 2015-02-07. Blancarte, Roberto. Historia de la Iglesia Católico en México. Mexico: Fondo de Cultura Económico / El Colegio de Méxiquense 1992. Cuevas, Mariano, S.J. Historia de la Iglesia de México. 5 vols. 1921-28. Mecham, J. Lloyd. Church and State in Latin America (revised edition). Chapel Hill: University of North Carolina Press 1966. Schmitt, Karl. The Roman Catholic Church in Modern Latin America. New York 1972. Baudot, Georges. Utopia and History in Mexico: The First Chroniclers of Mexican Civilization, 1520–1569. University of Colorado Press 1995. Brading, D.A. Mexican Phoenix: Our Lady of Guadalupe: Image and Tradition across Five Centuries. Cambridge: Cambridge University Press 2001. Burkhart, Louise. The Slippery Earth: Nahua-Christian Moral Dialogue in Sixteenth-Century Mexico. Tucson: University of Arizona Press 1989. Cline, Sarah. "Church and State: Hapsburg New Spain,” in Encyclopedia of Mexico vol. 1, p. 248-50. Chicago: Fitzroy Dearborn 1997. Cline, Sarah. "Church and State: Bourbon New Spain,” in Encyclopedia of Mexico vol. 1, p. 250-53. Chicago: Fitzroy Dearborn 1997. Cline, Sarah. "The Spiritual Conquest Re-Examined: Baptism and Church Marriage in Early Colonial Mexico." Hispanic American Historical Review 73:3(1993) pp. 453–80. Costeloe, Michael. Church Wealth in Mexico: A Study of the Juzgado de Capellanías in the Archbishopric of Mexico, 1800–1856. Cambridge: Cambridge University Press 1967. Farriss, N.M. Crown and Clergy in Colonial Mexico, 1759–1821. London: Athlone Press 1958. Greenleaf, Richard. The Mexican Inquisition of the Sixteenth Century, 1536–1543. Washington DC: Academy of American Franciscan History 1962. Gruzinski, Serge. The Conquest of Mexico: The Incorporation of Indian Societies into the Western World 16th-18th Centuries. Cambridge: Cambridge University Press 1993. Kubler, George. Mexican Architecture of the Sixteenth Century. New Haven: Yale University Press 1948. Morgan, Ronald J. Spanish American Saints and the Rhetoric of Identity, 1600–1810. Tucson: University of Arizona Press 2002. Phelan, John Leddy. The Millennial Kingdom of the Franciscans in the New World. Berkely: University of California Press 1970. Poole, Stafford. Pedro Moya de Contreras. Berkeley: University of California Press 1987. Poole, Stafford. Our Lady of Guadalulpe: The Origins and Sources of a Mexican National Symbol, 1531–1797. Tucson: University of Arizona Press. Ricard, Robert. The Spiritual Conquest of Mexico. Translated by Lesley Byrd Simpson. Berkeley: University of California Press 1966. (originally published in French in 1933). Schwaller, John Frederick. Church and Clergy in Sixteenth-Century Mexico. Albuquerque: University of New Mexico Press 1987. Schwaller, John Frederick. The Origins of Church Wealth in Mexico. Albuquerque: University of New Mexico Press 1985. Taylor, William B. Magistrates of the Sacred: Priests and Parishioners in Eighteenth-Century Mexico. Stanford: Stanford University Press 1996.
von Germeten, Nicole. Black Blood Brothers: Confraternities and Social Mobility for Afro-Mexicans. Gainesville: University of Florida Press 2006. Bazant, Jan. Alienation of Church Wealth in Mexico: Social and Economic Aspects of the Liberal Revolution, 1856–1875. Cambridge: Cambridge University Press 1971. Callcott, Wilfred Hardy. Church and State in Mexico, 1822–1857. Durham: Duke University Press 1926. Ceballos Ramírez, Manuel. "La Encíclica Rerum Novarum y los Trabajadores Católicos en la Ciudad de México, 1891–1913." Historia Mexicana 33:1 (July–September 1983). Costeloe, Michael P. Church and State in Independent Mexico: A Study of the Patronage Debate, 1821–1857. London: Royal Historical Society 1978. Mijanos y González, Pablo. The Lawyer of the Church: Bishop Clemente de Jesús Munguía and the Clerical Response to the Mexican Liberal Reforma. Lincoln: University of Nebraska Press 2015. Schmitt, Karl M. " Catholic Adjustment to the Secular State: The Case of Mexico, 1867–1911." Catholic Historical ReviewXLVIII No. 2 (July 1962) 182-204. Scholes, Walter V. "Church and state in the Mexican Constitutional Convention, 1856-57." The Americas IV No. 2. (Oct. 1947), pp. 151–74. Bailey, David C. Viva Cristo Rey! : The Cristero Rebellion and Church-State Conflict in Mexico. Austin: University of Texas Press 1974. Bantjes, Adrian. "Idolatry and Iconoclasm in Revolutionary Mexico: The Dechristianization Campaigns, 1929–1940." Mexican Studies/Estudios Mexicanos 13:1 (winter 1997), pp. 87–120. Blancarte, Roberto. "Recent Changes in Church-State Relations in Mexico: An Historical Approach," Journal of Church & State, autumn 1993, Vol 35. Issue 4. Butler, Matthew. "Keeping the Faith in Revolutionary Mexico: Clerical and Lay Resistance to Religious Persecution, East Michoacán, 1926–1929." The Americas 59:1 July 2002, 9-32. Camp, Roderic Ai. Crossing Swords: Politics and Religion in Mexico. New York: Oxford University Press 1997. Ceballos Ramírez, Manuel. El Catolicismo Social: Un Tercero en Discordia, Rerum Novarum, la 'Cuestión Social,' y la Movilización de los Católicos Mexicanos (1891–1911). Mexico: El Colegio de México 1991. Chand, Vikram K. Mexico's Political Awakening. Notre Dame: University of Notre Dame Press 2001. Ellis, L. Elthan. "Dwight Morrow and the Church-State Controversy in Mexico." Hispanic American Historical Review Vol 38, 4 (Nov. 1958), 482-505. Espinosa, David. Jesuit Student Groups, the Universidad Iberoamericana, and Political Resistance in Mexico, 1913–1979. Albuquerque: University of New Mexico Press 2014. Jrade, Ramón, "Inquiries into the Cristero Insurrection Against the Mexican Revolution." Latin American Research Review 20:2 (1985. Mabry, Donald J. Mexico's Acción Nacional: A Catholic Alternative to Revolution. Syracuse: Syracuse University Press 1973. Meyer, Jean. La Cristiada. 3 vols. Mexico City: Siglo XXI (1985). Meyer, Jean. The Cristero Rebellion: Mexican People Between Church and State. Cambridge: Cambridge University Press 1976. Muro, Victor Gabriel. Iglesia y movimientos sociales en México, 1972–1987. Mexico: Colegio de Michoacán 1994. Muro, Victor Gabriel. "Catholic Church: Mexico" in Encyclopedia of Mexico, vol. 1. Chicago: Fitzroy Dearborn 1997, 219-222. Purnell, Jennie. "The Cristero Rebellion" in Encyclopedia of Mexico. vol. 1. Chicago: Fitzroy Dearborn 1997, 374-377. Purnell, Jennie. Popular Movements and State Formation in Revolutionary Mexico: The Agraristas and Cristeros of Michoacán. Durham: Duke University Press 1999. Quirk, Robert E. The Mexican Revolution and the Catholic Church, 1910–1929. Bloomington: Indiana University Press 1973. Rice, Elizabeth Ann. The Diplomatic Relations Between the United States and Mexico as Affected by the Struggle for Religious Liberty in Mexico, 1925-29. Washington DC 1959. Sherman, John W. "Liberation Theology" in Encyclopedia of Mexico, vol. 1, 742-45. Chicago: Fitzroy Dearborn 1997. Vargas, Jorge A. "Freedom of Religion and Public Worship in Mexico: A Legal Commentary on the 1992 Federal Act on Religious Matters," BYU Law Review Volume 421 (1998), Issue 2, article 6. Wright-Rios, Edward. Revolutions in Mexican Catholicism: Reform and Revolution in Oaxaca, 1887–1934. Durham: Duke University Press 2009. Herbermann, Charles, ed. (1913). "Mexico" . Catholic Encyclopedia. New York: Robert Appleton Company. This page was last edited on 16 October 2018, at 13:27 (UTC).